Sterling silver with twist wire and stamped drops with 5 turquoise stones. Center measures approximately 1 1/2" wide and tapers to about 1". It has a dark, plain oxidized back ground. 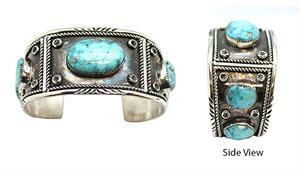 It is Navajo hand made by Bobby Becenti. 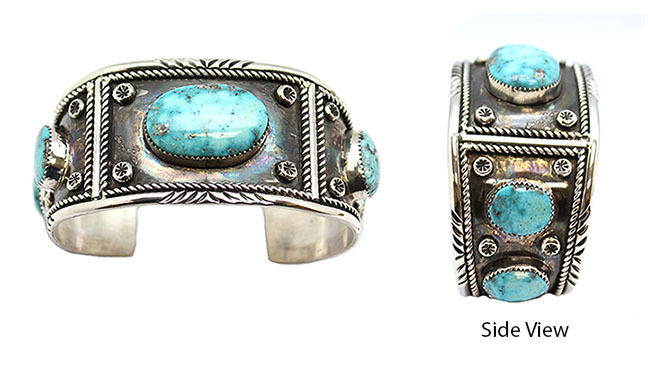 Available in Morenci turquoise as pictued or Kingman Teal. Both mainly in this light blue color shade. Wrist size available in 6", 6 1/4" or 6 1/2" with a 1 1/2" opening. Choose size when ordering.